Seeing as it’s June I thought a nice summery recipe was in order. 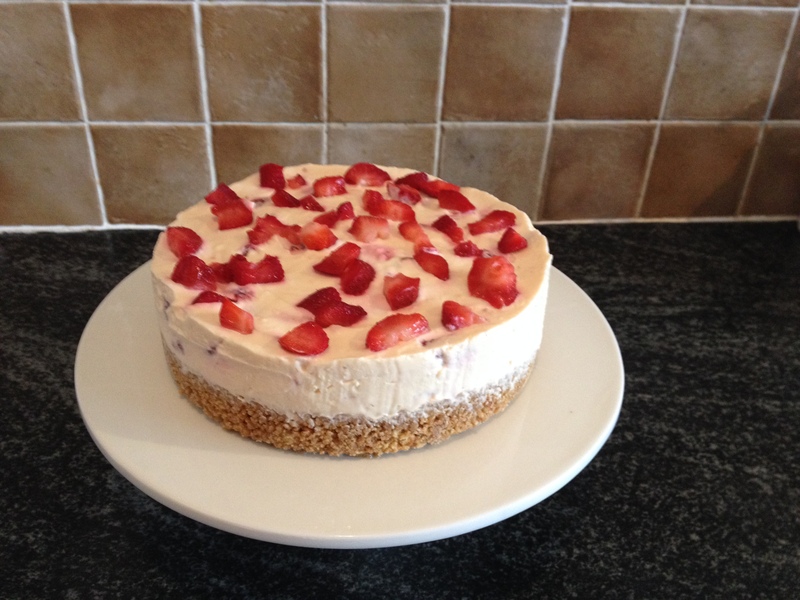 I am a complete chocolate addict but I do also love a nice fruity cheesecake – so I’ve married the two and got this FABULOUS white choc and strawberry cheesecake. 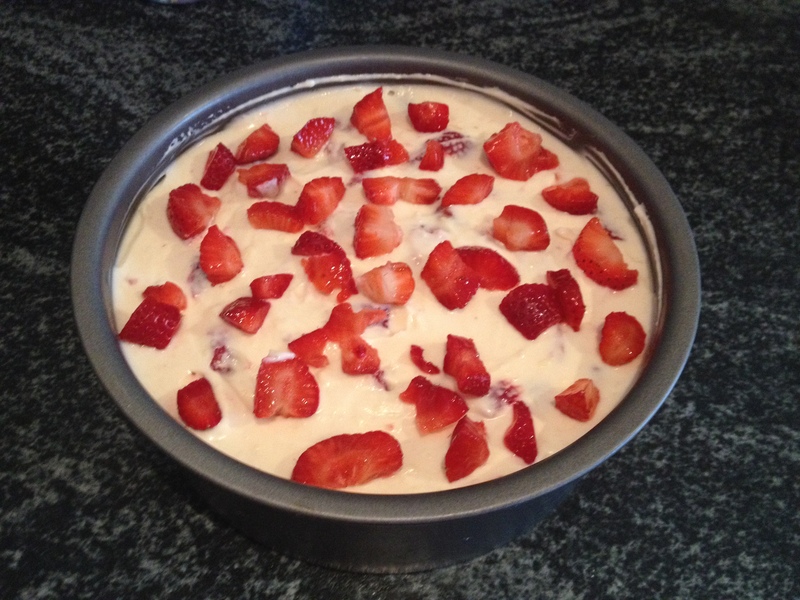 It’s simple to make and would be a perfect quick dessert to throw together in the decent weather and you have a BBQ! 1. First up, you need to get your biscuits bashed up and ground down. I don’t have a food processor so I do this with a rolling pin and some sandwich bags but if you have the food processor then go for it with that! 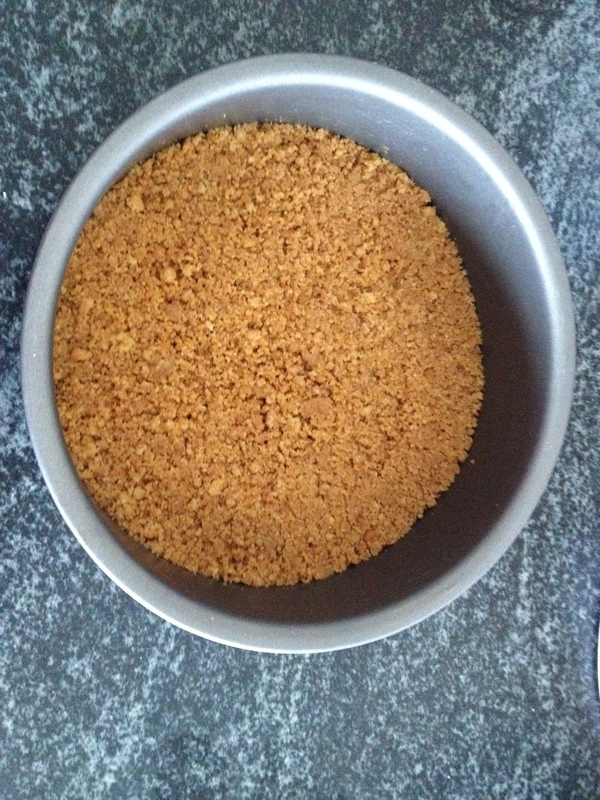 Now, in your mixing bowl, mix together the biscuit crumbs and Demerara sugar. 2. Melt your butter either in the microwave or in a pan and add it to the biscuit mix. Mix until it’s well combined and not all lumpy. 3. Put the biscuit mixture into a 20cm spring-form cake tin. Use the back of a spoon to press the biscuit crumbs down firmly. Now put it into the fridge and leave to set while you make the topping. 4. In your mixing bowl, using a whisk, fork or wooden spoon, beat together the cream cheese, icing sugar and vanilla pod seeds or vanilla extract until well mixed. I use the cream cheese in the below pic from Aldi – you don’t need Philadelphia as this does just as good a job. Just be sure to drain off any excess liquid from the pack of cream cheese. 5. 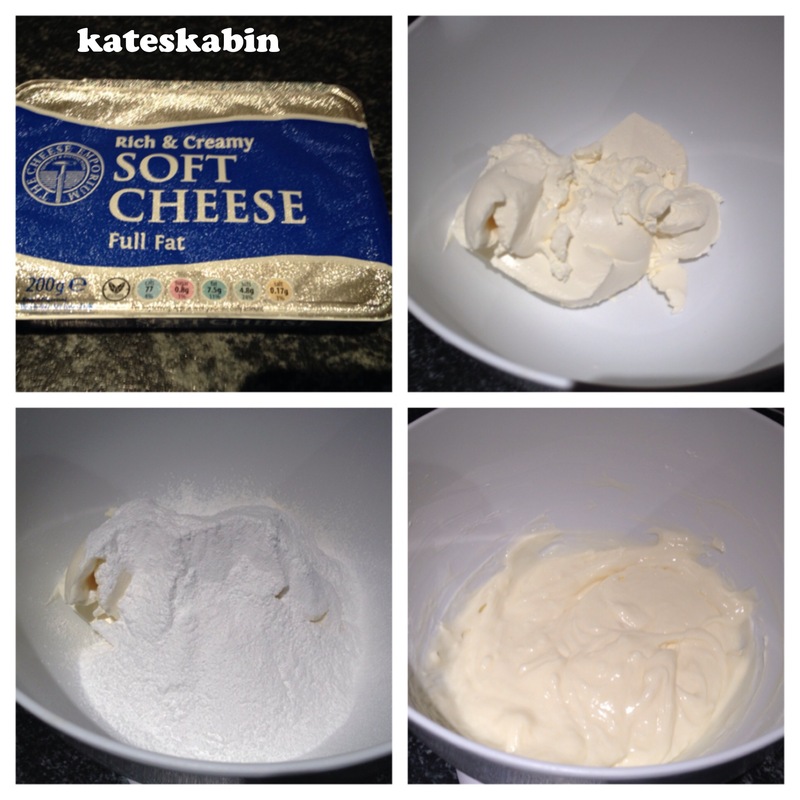 Fold in the double cream, mixing well. I would always use a whisk for this part to make sure you get the mixture stiff enough; otherwise you can have a pretty runny cheesecake. Beat until the mixture starts to stiffen quite a bit. 6. Melt your white chocolate now and leave it to cool slightly. 7. Take your strawberries (holding back about 5 to chop up and put on top)and chop them into quarters. Add them to the mix, then fold in your white chocolate. Mix it all well and don’t worry if the juice of the strawberries starts to turn the mix slightly pink. 8. 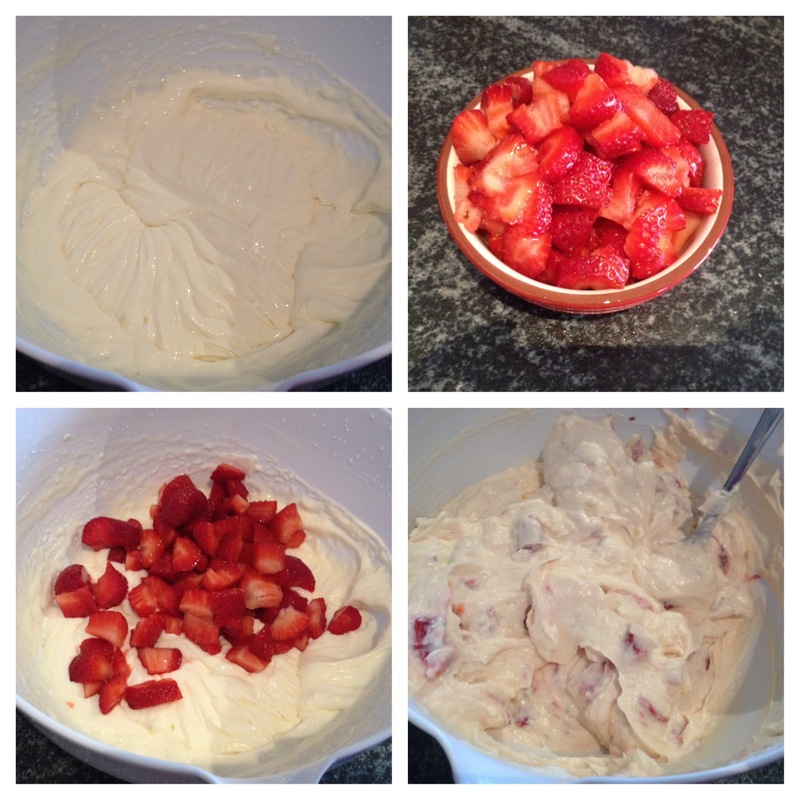 Spoon the cream mixture over the biscuit base and top with a few more chopped up strawberries. 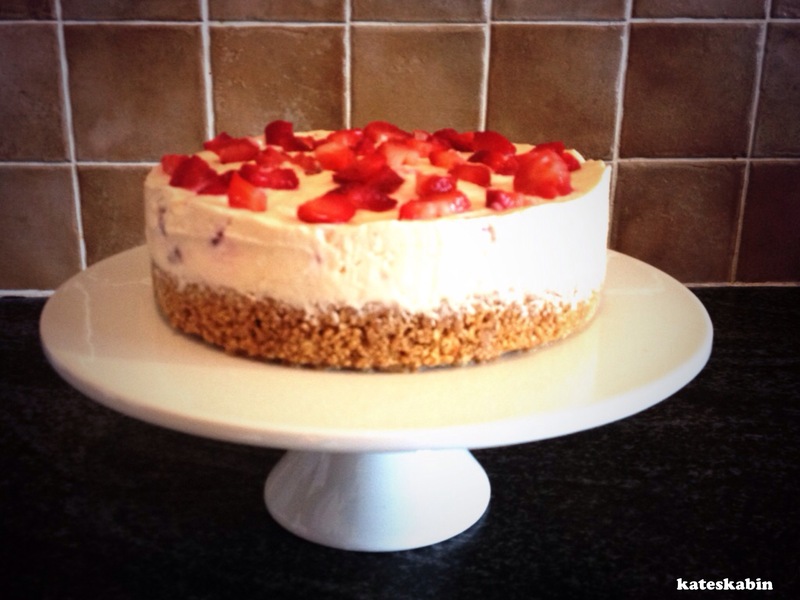 Throw the cheesecake back into the fridge for about 2 hours and by then it should be fully set. Now you can remove from the cake tin and cut into big fat slices and eat! If you get your base solid enough (use enough butter so it’s not crumbly) it should transfer from the tim easy enough. I use a big spatula thing to move mine!